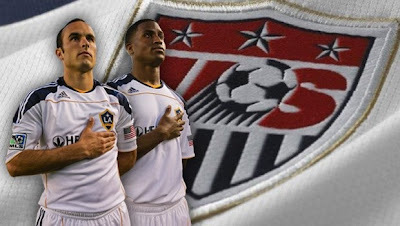 LA Galaxy forwards Edson Buddle and Landon Donovan have been included in the U.S. National Team’s preliminary roster for this summer’s 2010 FIFA World Cup in South Africa. Both players will depart for the National Team’s training camp in Princeton, N.J. on Sunday following the Galaxy’s World Cup Send Off game against Toronto FC on Saturday night at The Home Depot Center. Both players will miss a minimum of two games just for being named to the preliminary roster and will miss a minimum of two more if they are included in the final 23-man squad. For the first time in league history, Major League Soccer will take a two week break during the opening round of the World Cup, with the Galaxy not scheduled to play any league games between June 9 and June 26. Buddle, Donovan and the rest Galaxy are back home this week to take on Toronto FC at The Home Depot Center. That game, which will be played on Saturday, May 15, kicks off at 7:30 p.m. and is the club’s final game before players depart for training camp ahead of this summer’s FIFA World Cup. The first 15,000 fans in attendance will receive a special commemorative poster featuring Buddle and Donovan and there will be a ceremony held after the game as the Galaxy and their fans officially send their heroes off to training camp ahead of the World Cup. They both deserve it. They both & The Galaxy have had a great season so far. I hope that they can play that way in The World Cup. (If they both stay healthy). Seeing as this graphic is everywhere I assume this is what the poster you're handing out will be. Congrats to BOTH Landon and Edson for their hard work, focus, training, practice, and on-field tactics and power to get themselves as viable candidates to the WC 2010. Good for them, honestly! Both of them should really cherish and enjoy their time and their experiences. Hope both of them and our USMNT totally plays well and just rocks!